Map and text on inside cover. This fully updated The Rough Guide to Scottish Highlands and Islands is the ultimate guidebook to the captivating remote reaches of Scotland. From the divine seafood offerings at Loch Fyne to the whisky distilleries on Islay, this is a place for indulging. It's also a hotspot for outdoor activities, whether you decide to bag a Munro or two, hop onto a mountain bike or stroll along deserted (if blustery) golden beaches. 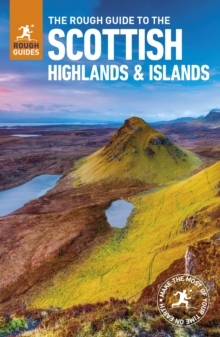 The Rough Guide to Scottish Highlands and Islands contains more information than ever on where to go and what to see in this part of Scotland, with practical information on everything from events listings to transport logistics. There's also coverage of the brand new North Coast 500 route, which loops around the northernmost reaches of the country.From Skye's breathtaking Cuillin ridge to abandoned castles, via riproaring unplanned ceilidhs, this stark and weather beaten part of the planet will not disappoint.Make the most of your trip to the Highlands and Islands with Rough Guides.